Pardon Moi? is back to the vaults of 2648, but this time accompanied by some friends. 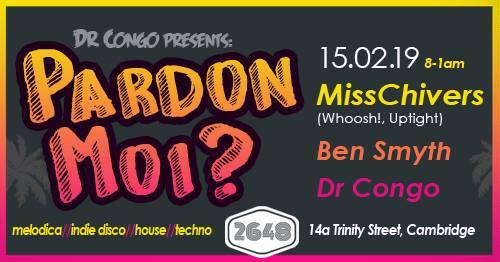 Get down to 2648 on Friday 15th February and join Dr Congo, MissChivers and Ben Smyth for a night of dancing! Expect nothing less than some of the coolest indie-disco, Synth-wave, House and Melodic Techno to keep your ears happy and your feet shuffling!